After all the preparations we could finally leave on our trip to Ghana. 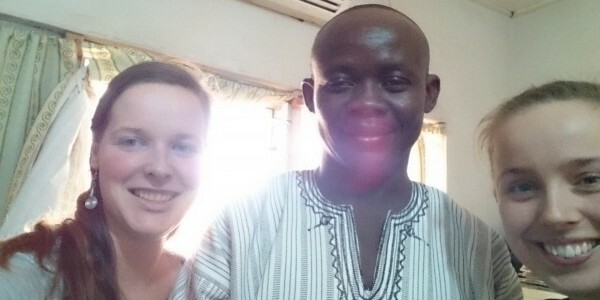 We, Céline (acquisition officer) and Marloes (president) left on the 5th of December to visit the West Gonja Hospital (WGH). We arrived in Accra, after a short stop in Barcelona, where Jimah was waiting for us. We left very early the next morning to catch our domestic flight. Unfortunately our flight was cancelled because of the bad weather. The alternative was to wait six hours at the bus station and an eleven hour during bus trip to Tamale , but in the end, we arrived! We spent a night in Tamale and met the students in the morning so we could get some souvenirs. The driver of the WGH picked us up around noon and we finally went to Damango. Finally we could see all the things we talked about: the MUSTANGH house and the West Gonja Hospital. The next morning we were given a tour of the hospital. It looked all very clean and professional. Some of the wards were renovated, which was financed by the government. The wards that were renovated are the male and female ward and emergency department. The infrastructure around the hospital has also been improved with a paved road and high fence. Luckily mr. Remy managed to arrange a meeting with the board of the hospital that afternoon. It was useful and we discussed a lot of topics. In the evening we had a nice Ghanaian dinner with the students and there was some time to talk about their time in Ghana and their work in the hospital. Wednesday morning we had the chance to do the rounds with the students. It was very impressive to see and of course we learned a lot. During the day we had a lot of meetings. We spoke with the head of the medical staff, dr. Jonathan. We had a good discussion with mr. Remy about current and new sponsor projects. Back at the MUSTANGH house we spoke with Jane, the housekeeper, and Kassim, the night watchman. The afternoon was free so we had some time to visit Mole National Park. It was absolutely worth it to go there and we even saw some swimming elephants. In the evening we went for a Ghanaian beer on the motorbikes of the students. Opinions differed over whether it was tasty, but we enjoyed the new experience. On Thursday morning we did rounds again and we saw the operating theatre and the ultrasound MUSTANGH sponsored a few months ago. It was very nice to see that they were very happy with the machine and to hear that they use it a lot. After that, all three doctors had made time for us and we spoke with them mainly about the supervision of the students. In the afternoon it was already time to say goodbye to everyone and to leave to Tamale. We spent the Friday travelling back to Accra by bus because the domestic flight was cancelled again. Our last day in Ghana we did some sightseeing in Accra. We visited Jamestown, an old fortress that was used during the time of slavery and later served as a prison and an old, but still working, lighthouse. After that it was time to relax and we spent some hours at the beach. Unfortunately it was time to go back to the Netherlands and we arrived at Schiphol on Sunday afternoon. In the end it was a really short journey, but we did everything we wanted to do. All in all it has been a really nice trip, which was very useful for us and for MUSTANGH. For us it was very motivating to finally see everything we have been working for. We are really motivated to set up new projects, so we are going to start very soon with this!